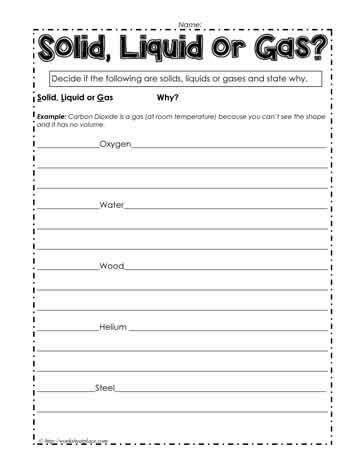 Determine if the following list of matter is a solid, liquid or gas and state why. Children should have had some exposure to the properties of matter before they attempt the matter worksheet. Oxygen, wood, helium, water, steel are all states of matter. Determine why each of them are a liquid, solid or a gas. For an extension activity, determine if any of the items can change state.